It is “door knocking season” for me as I write this. As I go door-to-door and speak with my constituents, I too often come home saddened by reminders of how many of us are troubled by things that should not be happening in a healthy middle class society. Our children don’t have the schools we think they should, we worry more about access to health care, the roads we drive have more potholes, our climate is harsher, and our paycheck doesn’t go as far as it used to. Those opportunities come more easily for those who have the good fortune to live in a middle class economy. To make sure everyone has that advantage, we must focus on the things we have to do together. In my book We All Do Better, I prioritize what I call “the five building blocks of a middle class society”: education, health care, transportation, clean energy, and living wage jobs. Maintaining these foundations must be our number one legislative priority if we are to provide for ourselves, our neighbors, and our children with the opportunities they deserve. I can hear the objections already: “This is too expensive! Where will the money come from?” When people say “We can’t afford this!” we will also have to remind them that, even more so, we can’t afford the alternative, that is, a Third World economy in which most of us lack for opportunity. That is not the American dream. This was not the intent of those who wrote our Constitution. And this is not a path that will lead us out of the despair that motivates so many voters in today’s elections. Before we are lead into despair by those who shout “we can’t afford a good life for everyone,” let’s think in our history. Sixty years ago, our leaders were guided by economists who thought very differently about how to build the economy. They believed in full employment and using our tremendous wealth to educate people, provide health care, build roads and infrastructure, support labor unions and protect our natural resources and national treasures. After World War II, politicians began to ask if we could pull together and put our resources into defeating Hitler and Fascism, why couldn’t we put our tremendous wealth toward helping everyone make the most of the freedom so many had died to defend? Things like the GI bill, Home Credit, and many other policies grew the economy by growing opportunities for people. How did we do it? We taxed the rich at a much higher rate than we do today. The general consensus was that an economy leaning toward income equality was good for all of us. Now somehow we have accepted that it is OK for the wealthy to hide cash in secret accounts rather invest in our future. I am reminded of a story from the gospel of Matthew in which servants were rewarded for reinvesting their master’s money and punished for burying it in the ground. I believe we can recapture that ‘we all do better’ spirit by thinking big as President Kennedy did when he lifted our spirits with big goals. We must not forget what President Johnson did when he got us to believe in a great society that included everyone regardless of race or any of the other differences that the forces of darkness use to separate us. What I don’t believe is that today’s tax breaks for the rich, small government thinking, and ideological shouting matches can get us where we need to be. Instead, we must restore our priorities so that they are in line with the idea of opportunities for all. We are still the world’s richest country. What we do with that great wealth and what policies can make better use of that wealth to continue to create opportunity and prosperity is everyone’s business. Changing the conversation about how we move forward and build and maintain a middle class economy is not an easy task. This is going to be a big job, far too big for any one of us, or even any group of us, to get done on our own. All of us working together is a different story. We can get this done as it was done once before. We can renew our calling to build “a more perfect union” for all Americans. And we can live in a country where the words “The Land of Opportunity” truly mean something, not just for a privileged few, but for each and every one of us. 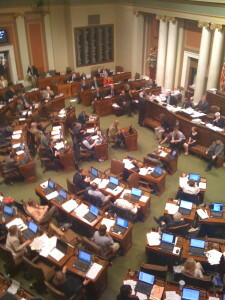 David Bly is serving his fourth term in the Minnesota House of Representatives. His new book We All Do Better is available at www.WeAllDoBetter.com.